But that's for Submachine 10 and as for the words they are from H.P. Lovecraft. One of his short stories about underground machines. You can find that in Submachine Universe. Its just another inspiration. Ah, I thought he was referring to the pictures from the telescope that he decompiled. That's like having your cake and eating it too. Submachine 7 opens similarly to 32 chambers. An abundance of keys is obtained before even tackling the first lock, and even more keys are obtained soon after solving the first two puzzles. It is when the player reaches the portal that the game starts to shape a distinct identity from 32. To progress, the player must unlock a multi key lock demanding 6 keys. Unlocking this leaves the player with just two notes and a gong, completing the first act of the game. The winter palace serves as the hub for the second act of the game. The player's first goal here is simple: unlock a door to reactivate three closed gates. Opening the gates leaves the player with one path forward, through the second gate to solve 3 more locks. Only the second and third gate must be used to collect all the necessary keys for the next multi key lock, demanding 7 keys from the player. The player can also find three symbols, which will find their use in act 3. The two notes from act 1 come into play when solving the second multi-key lock puzzle. While the third act sees the player use the south garden a lot, there is also one new area to explore in the winter palace. In here the player is given the third and final multi key lock puzzle, demanding 9 keys from the player. 5 of these are in the new area while the sixth through ninth sees the player go back to the south garden. 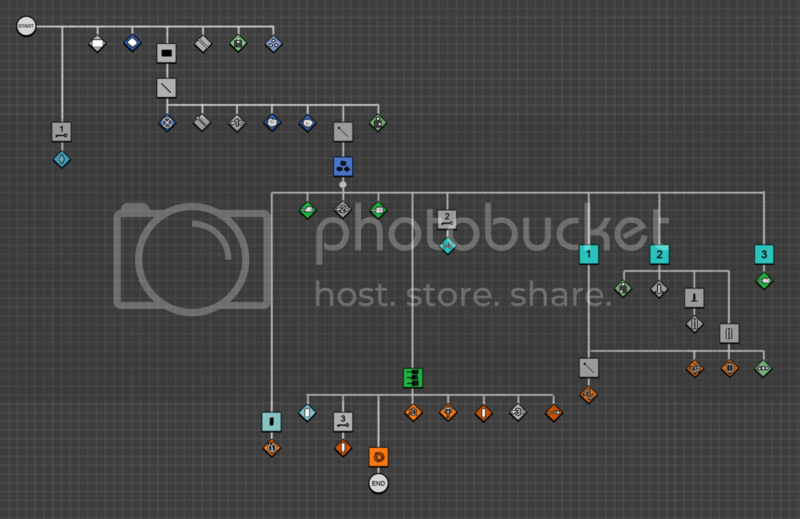 Submachine 7 borrows a lot of design principles established in submachine 32. The player must unlock three multi key lock puzzles in the core to complete the game. What makes the core unique is that the player must unlock these three multi key locks sequentially in three separate acts, with only 2 or 3 additional keys given to hint towards the next multi key puzzle. Similarly to 32, the player is given little choice in what order they solve the locks (since there are so few), and the game sees 3 major instances of backtracking. Designing the game this way makes for a game that feels predetermined, but rich and free to discover things at your own accord. Designing submachine 7 into three distinct acts made it possible to tell a three act story with distinct vibes, The first act in the sanctuary has an aggressive vibe, the second a peaceful one and the third an ominous vibe. While the key and lock layouts are very similar in all three acts, and could perhaps have benefited it they had been redesigned to fit with the atmosphere of each act better, giving the graph this structure helps a lot in keeping both the game and story flow interesting. While a strong entry in the series in terms of storytelling, the dungeon graph could see some benefit in having some more variation and subtleties.